Name, is the entity which travels with us through-out our life. It is used in each and every important stage and adds up the flavour. 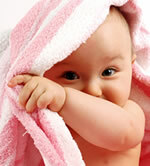 We at LuckyBabyName.com give a perfect baby name which can make them fortunate. Most of the trouble, illness in health, lack of concentration, irritating nature, not eating properly are mostly caused by the child's name not being in harmony. Get the right naming solution for your child after consulting with an astro numero consultant for overall success in life. On receipt of payment, the baby name astrologer, Dr. Raja, will prepare your child's Horoscope / Chart & give best starting letters for the name based on Astrology & Numerology, if required. Parents of the child should provide minimum 3 proposed names to enable the Astro Numero consultant, Raja to select the Right Lucky Name. In case, if the names given by you are not suitable, you can send some more names until the baby name astrologer, Raja selects the right name. There will be NO extra charges for this service. Click here for Online / Credit card Payment through Veri-sign secured payment portal CC Avenue. This portal also accepts VISA credit cards, all debit cards, pay-pal, bank transfer etc.., excluding Master Card. 1. Who will be processing my credit card? Your payment information is processed in real time through CCAvenue.com. during checkout, you can pay either using your credit card, debit card, Bank transfer, Paypal etc. We do not have any access whatsoever to your credit card information. Master-card will not be accepted for this service, as per Master-card policy - as this service comes under Astrology. 2. Is your server secure? Yes. CCAvenue.com, through which we process the secure payment, is a Veri-Sign secured payment portal and has implemented state-of-the-art security standards. 3. What happens if the names given by us are not suitable? PR Sundhar Raja, the baby name astrologer in India, will analyze your child's birth details and select the best name among the names suggested by you and reply through e-mail. In case, if the names given by you are not suitable, you can send some more names on hearing from us, until the Astro Numero consultant, Raja selects the right name. There will be NO extra charges for this service, as it is also Raja's concern to give the best name for your child. 4. Can we meet PR Sundhar Raja in person for baby name astrology services? PR Sundhar Raja, the baby name astrologer in India as a policy does NOT give predictions for children under 18 years of age. However, if you still want to meet the Astro Numero consultant in person to get the right lucky name for your child, you can contact us for name input / clarifications. Dr. Raja as a policy DOES NOT give 'C' section date / time. You can also avail personal / telephone consultations for adults. 5. Whom to contact for further questions or concerns for astrology consultancy services? Mrs. Shobha: + 91 98400 20243 - during office timings 10am to 5pm - IST. Lucky Baby Name & Astro Number No: 1, Z Block - 1165, 6th Avenue 4th Building, Opp. to Nuts 'n' Spices Anna Nagar West, Chennai - 600 040.